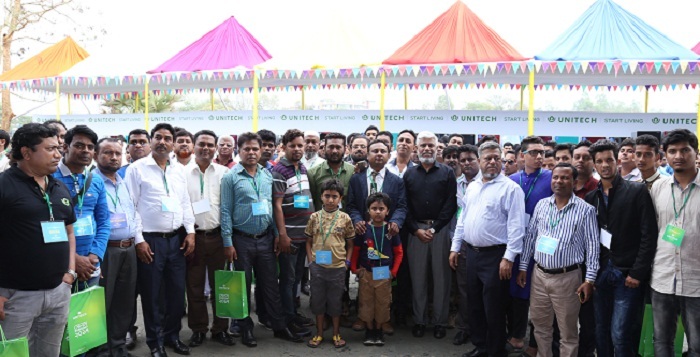 A day long sales conference of Unitech Products (BD) Ltd. has held at its factory area in Kabirpur Industrial Area, Savar. About 310 distributors from across the country took part in the one-day conference held on Saturday, March 11, 2017, and had an exclusive experience of visiting the factory. Addressing the dealers, Engr. Anis Ahmed, Managing Director of Unitech Products (BD) Ltd said that with the help of everyone, Unitech is going to be the best electronic brand in Bangladesh. At the same time, he also articulated his dream of spreading the Unitech products to every doorsteps of Bangladesh. Later, he had an interactive session discussing the different aspects of Unitech products with the dealers. Soon after, he launched Unitech Smart TV with three exclusive models. Anis Ahmed then announced the best national and divisional dealers and honoured them with a certificate, crest and prize bonds. The winners are M/S Rupali Electronics (national 1st), Lea Enterprise (national 2nd), M/S Madina Electronics (national 3rd), M/S Sundorban Electronics (Dhaka division), Alauddin Electronics (Chittagong division), M/S Shanto Electronics (Rajshahi-Rangpurdivision), M/S Nurul Enterprise (Khulna division), Fair View Electronics (Barisal division), and Feedback Communication (Sylhetdivision). The conference were also attended by AKM Hamidur Rahman, Business Development and Planning Manager; AkhterHossain, Sales and Development Manager and Jakir Hossain, Sales Manager-Dealer Channel.